While the vast majority of Canadian snowbirds still head to the United States every winter, the fall of the Canadian dollar has caused quite a number to look for more affordable alternative destinations. Not surprisingly, Mexico is probably the single largest destination after the U.S. for Canadian snowbirds. And this is not just a recent phenomenon. Canadians have been wintering in Mexico for decades, taking advantage of several different climate zones – all of them warm - and a very favourable exchange rate for the Canadian dollar. Mexico’s varied geography and wonderful mix of colonial cities, ancient ruins, breathtaking mountain ranges and tropical beach resorts provides snowbirds with a wealth of choices. Add to that the opportunity to learn and practice Spanish and discover the easy lifestyle of our Mexican neighbours – all at a fraction of the cost of going to the U.S. or Southern Europe - and you can understand why a growing number of Canadians are heading to Mexico each winter. Getting there is easy enough from Canada with many charter flights going into the various tourist resorts on the Pacific and Atlantic coasts, as well as scheduled flights and connections into Mexico City and other major centres from several Canadian gateways such as Toronto, Montreal, Calgary and Vancouver. Driving to Mexico from Canada, while possible, is generally not recommended, because you have to travel through the less-than-safe northern regions to get to these destinations. So where in Mexico do Canadian snowbirds gather? Here’s a brief overview of several popular places. This colonial city is located about 250 kilometers northeast of Mexico City. San Miguel has a sizeable expat community that swells each winter with snowbirds from Canada and the United States. The historic center is very walkable and has many buildings from the 17th and 18th centuries on cobblestones streets. San Miguel de Allende is considered to be the prettiest town in Mexico by many and is safe to walk around day and night with a mild winter climate. Although many people come here to learn Spanish, it is relatively easy to find services in English and hotels and restaurants cater to the Americans, Canadians and Europeans who gather here. San Miguel is a very artsy town and a beacon for both established and aspiring artists. Visitors attend courses, studio openings and workshops each winter. Galleries, boutiques and shops sell all types of art and local handicrafts. Many snowbirds also take Spanish courses. This temperate destination has long been a favourite for retirees, and although only 85 kilometers from Mexico City, it is set in the mountains and enjoys year-round spring like weather with temperatures around 21 C.
The capital city of Morelos, it has a long history as a haven of relaxation and rejuvenation dating back centuries. Cuernavaca has beautiful scenery and is a natural garden filled with many colors and scents from the many flowers, shrubs and trees. The city features beautiful plazas and historic colonial buildings in the Historic Centre where you will find the beautiful Cathedral. The city has several ravines including Amanalco, with its hanging bridges and Barranca de San Antonio with its beautiful waterfall. The dramatic mountain setting around Cuernavaca includes volcanoes, meadows and rivers, making it a wonderful location for Canadian snowbirds who love the outdoors. Climbing, white water rafting, kayaking, cannoning and mountain biking are all available – along with some great golf courses. For snowbirds who just want to relax, there are also wonderful spas here. Lake Chapala is one of Mexico's most popular snowbird destinations for many years now. A large fresh-water lake located at 5,000 feet in the mountains near the city of Guadalajara, snowbirds appreciate the perfect climate, beautiful lakeside homes, low cost of living and flourishing snowbird community here. Snowbirds love the simple way of life with a very relaxed pace. Fresh food of all kinds can be bought in the street markets at a fraction of the cost in Canada and the overall cost of living is very affordable for Canadians. Some English is widely spoken due to the influx of retirees in the area, but there is ample opportunity to practice your Spanish with the locals as well. Speaking some Spanish is a definite plus here. There are also lots of activities arranged by the community of Canadians and Americans living in the area in the winter, offering a great opportunity to connect with other snowbirds. Baja California, or “The Baja”, is the peninsula that extends into the Pacific from the U.S. border southwards. It creates an inland sea known as the Sea of Cortez. Both coasts of the Baja peninsula have resort towns and regions where you will find lots of snowbirds in the winter. You’ll find snowbirds on the eastern side of the Baja peninsula in San Felipe and La Paz, on the western side in Ensenada and on the southern tip of the peninsula in Cabo San Lucas and San Jose del Cabo. On the mainland coast to the east of the peninsula and farther south is Mazatlan, another popular snowbird destination. The weather here is not hot in the winter, but mild enough for those escaping the colder temperatures farther north – often described as similar to the Mediterranean in winter. The region is arid and desert like, and is a mecca for sailors in the winter time. The water can be rough and is not good for swimming in some parts - but there’s lots of water sports, and hiking and biking are very popular. Snowbirds rent condos or houses, live on sailboats or stay in small inns and boutique hotels. The Baja is also accessible by road from the U.S. and some Canadians bring their RVs down for the winter. One of the most popular towns in Mexico for snowbirds and other expats each winter is Puerto Vallarta, the former fishing village on the Bay of Banderas first made famous by Richard Burton and Elizabeth Taylor, who made The Night of the Iguana here, and who frequented the town for their own romantic getaways. 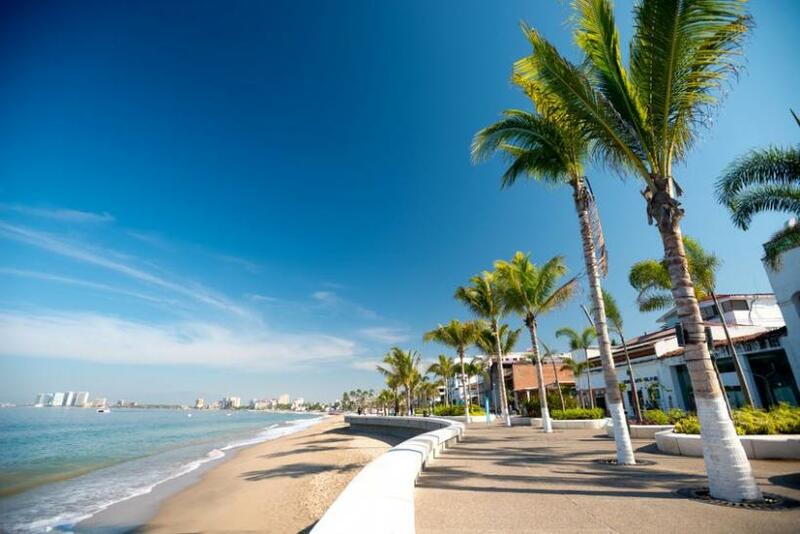 Puerto Vallarta today is a thriving resort town with an established downtown area bustling with shops, boutiques, galleries, restaurants, bars and the famous Malecon along the waterfront. Branching out to the north and south are many resort hotels and rental apartments to suit all budgets as well as condo developments for those interested in buying a vacation property. Snowbirds will not want for things to do in PVR as it is known – there are many golf courses, watersports of all kinds, beach walking and swimming. Puerto Vallarta has an international airport that is served with many flights direct from various Canadian gateways year round. The region just to the north of Puerto Vallarta is now just as busy with resorts and condos, as many snowbirds prefer to be away from PVR itself – staying in Nuevo Vallarta, Riviera Nayarit and the fishing town of Bucerias. Heading south from Puerto Vallarta you will find the former fishing villages of Manzanillo and farther south still, Zihuatanejo, which has the resort town of Ixtapa just to the north of it. Both Manzanillo and Zihuatanejo/Ixtapa attract their share of Canadian snowbirds in the winter months and have a variety of accommodations to rent for long stays. They both have lovely beaches, golf, a laid back lifestyle and offer an opportunity to live in a real Mexican seaside town. Much farther south you will find lovely Puerto Escondido in the state of Oaxaca. The beaches here are breathtaking and there are rentals available for long stays in condos and villas. Surfing is very popular here, as is fishing. The Yucatan Peninsula has seen incredible tourism development in the past 30 years and there is now an entire region that has modern infrastructure, complete with resort hotels, boutique hotels, condos, apartments, golf courses and eco adventure parks. The Mayan Riviera corridor from Cancun to Tulum in Quintana Roo offers many places for Canadian snowbirds to stay for the winter. However, the majority will stay in rented condos and apartments near the resort town of Playa Del Carmen and Puerto Morelos. The Mayan Riviera offers plenty to see and do with Eco parks, golf courses, tennis centres, watersports of all kinds and wonderful beaches. Cancun itself is primarily for short-term tourists but there are some longer stay options in the town. Merida is another Yucatan city that is attracting some snowbirds. It is the capital of the state of Yucatan and is steeped in Colonial history as well as being home to many beautiful churches and plazas. The city has a lively cultural scene with concerts, museums and theaters.